Coun Richard Wearmouth, cabinet member for economic development and regeneration at Northumberland County Council. The poor track record of business improvement districts in Northumberland has continued, with ratepayers very narrowly voting to reject the Blyth BID. BIDs are business-led partnerships created through a ballot process to deliver additional services to local businesses. They are funded through a levy on all eligible premises within the BID area. The Government states they can be a powerful tool for directly involving local businesses in local activities and allow the business community, local authorities and other key partners such as the police to work together to improve the local trading environment. However, they have not been successful in Northumberland so far. 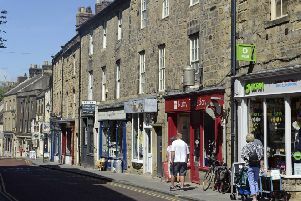 Hexham’s BID was the first to be set up and it did pass the ballot and start operating in October 2016, only to be the subject of ongoing issues and controversy. This eventually led to the arrangements being terminated as of September 10. The demise of the Hexham BID came on the back of the Morpeth BID being rejected at the vote in April, leaving Blyth’s as the only other BID in development in the county. But the results of the postal ballot, which closed last week, revealed that a majority of the business ratepayers in the proposed BID area who voted, did so against the proposal. The total number of votes cast in favour of the establishment of the Blyth BID was 59, representing 49.2 per cent of the number of votes cast and 72.5 per cent of the rateable value of votes cast. To establish a BID, a majority both in votes cast and in rateable value of votes cast is required. The total number of votes cast in the ballot was 120, representing an overall turnout of 28.78 per cent. The county council’s position is that the introduction of BID arrangements is for local businesses to decide. Nonetheless, the local authority supports them where they are backed at the ballot box. Coun Richard Wearmouth, cabinet member for economic development and regeneration at Northumberland County Council, said: “I would like to thank everyone who took part in the ballot. “As a council, we are clear that BIDs must be supported by the business community and this ballot result means that a BID won’t be introduced in Blyth. In Blyth, the town-centre area proposed included around 439 eligible properties and it was suggested that there would be a compulsory levy of 1.5 per cent of the rateable value, although there would be an exemption for those businesses with a rateable value of £4,000 or less, as well as a local charity exemption. This would have brought in around £134,000 in the first year and a total of £670,000 over the five-year lifespan of the BID. The proposed business plan had focused on four key areas: Enterprising and Dynamic; Bright and Appealing; Marketing and Promoting; Safe and Welcoming. At the Ashington and Blyth Local Area Council meeting in September, members heard that around 87 per cent of the businesses in the proposed BID area would end up paying less than £1 a day through the levy.